Tickets: 5 € (reduced 3 €) – Tuesday to Friday, opening 15.00-19.00; Saturday and Sunday until 20.00. From 24th January to 22nd March, WOW Spazio Fumetto – Museo del Fumetto di Milano turns into Middle-Earth hosting the great art exhibition La Magia dell’Anello (The Magic of the Ring), curated by Riccardo Mazzoni, vice-director of WOW Spazio Fumetto, Ninni Dimichino, chairman of the Italian Tolkien Society and Davide Martini, expert in Tolkien Art, dedicated to the saga de The Lord of the Rings, starting from the involving figure of its author J.R.R. Tolkien up to the lucky movie adaptations by Peter Jackson. The exhibition is characterized by an extraordinary – never seen before – corpus of original artworks, mostly published, composing its chronological development and so following the tale of J.R.R. Tolkien’s life and his books’. About a hundred artworks have been selected by the Art Director of Greisinger Museum, Davide Martini, coming from the museum itself, the only one dedicated to Middle-Earth all over the world, from Dama Collection, actually the second collection of art inspired by Tolkien’s world, and by courtesy of various artists for a cultural offer devised in order to give the visitors the opportunity to encounter and come to know the history of the figurative genre based on the tales of J.R.R. Tolkien. After a foreword with copies of works of the English writer and accompanied with the illustrations taken from the first Hobbit translations, the show gets on to the first original piece displayed, Gandalf (relates his adventures) by the Dutch Cor Blok, dated 1960, the first artist ever to realize pictures envisioning Tolkien’s masterpiece. It continues with the original plates of Dewar Ferguson for The Hobbit adapted in the 1964 magazine Princess, up to fly across the ocean. 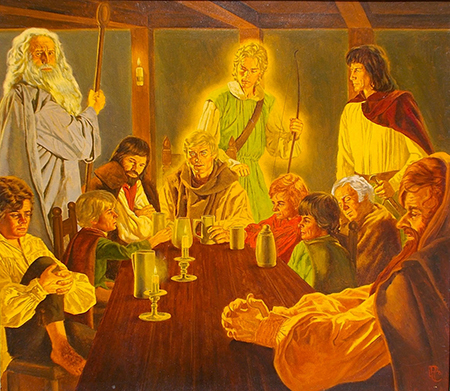 Directly from the pages of the first Tolkien Calendars, the originals by Tim Kirk and The Brothers Hildebrandt exhibited together with other artists such as Stephen Hickman, Doug Beekman, Peter Caras, all interpreters of an all-“American” Middle-Earth, distinguished in strong contrasts and bright colors. These aspects we can find also in Ralph Bakshi’s seven cels employed in his animated The Lord of the Rings, as well as in the painting created for Rankin Bass TV production or in the work, although 20 years later, of Carol Emery Phenix. Thanks to Roger Garland we’ll witness the return of Middle-Earth illustration to the Old Country and his artworks are going to be exhibited along with Linda Garland’s ones (David Day, A Tolkien Bestiary) and of the Swedish Inger Edelfeldt’s, to tell this new distinctive period during the ‘80s, a decade that sees the key passage between the shown and a “must-live” image by means of the inventions of Chris Achilleos and Angus McBride. So we moved to the six ink drawings by Philippe Munch, part of his work for the French illustrated edition of The Lord of the Rings, the first containing realistic illustrations, 3 years earlier the most-known edition curated by Alan Lee, presented here in show too with a 1984 drawing, an idea then presented again and enhanced in the realization of The Siege of Gondor. The history of The Lord of the Rings illustration is completed with a table of the 1974 Luis Bermejo’s comic and the exceptional presence of no less than 59 pictures realized in 1970 by Her Majesty Queen Margrethe II of Denmark, for the first time shown in Italy thanks to the care of Riccardo Mazzoni. The first time as well for the three Piero Crida’s watercolors prepared for the Italian 1974 The Lord of the Rings covers (separated volumes edition), published by Rusconi, images to which Italian passionates are very attached. Many original artworks belong to the 90s, years of the final crack in US-UK duopoly and of the widest spread of the Tolkienian illustration all over the western world, especially thanks to the collectible cards game ICE Middle-Earth CCG. 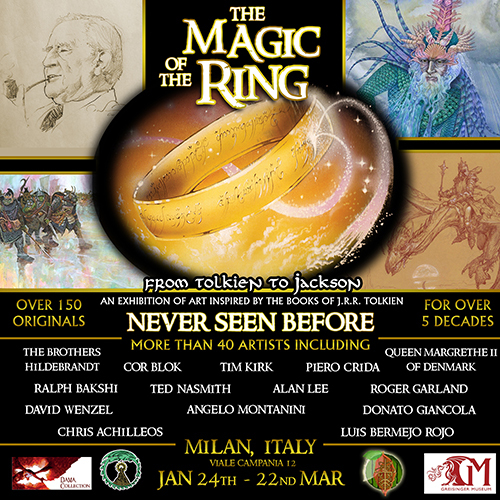 We can admire artworks by Ted Nasmith, Rob Alexander, Tom Cross, Audrey Corman, Brian Snoddy, Stephen Walsh, Jeff Reitz, Omar Rayyan, Steve Otis, Allen Douglas, Romas Kukalis and including also two Italian artists, Stefano Baldo ed Angelo Montanini: Montanini, the most important Tolkien illustrator of the belpaese , contributes with the entire company of his original 13 Dwarves, an assembly here proposed for the first time. 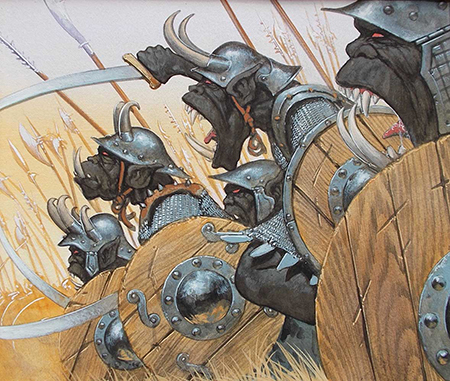 Other great successes of this decade are the adaption of The Hobbit into the comics version illustrated by David T. Wenzel, some of whose pictures are going to be in the exhibition, and of The illustrated Silmarillion by Ted Nasmith, represented by the masterpiece Ulmo appears before Tuor, coming from the Greisinger Museum. Anke Eissmann, Andrzej Masianis, Tomasz Oracz and the Italian Maria Distefano, Ivan Cavini, Diego Iaconfcic, Fabio Leone, Emanuele Manfredi, Andrea Piparo, an art exhibition disclosing an unmissable occasion for any who want to approach the art of fantasy and above all the history of Middle-Earth illustration.